It's the first day of Summer here. In Australia, we don't really wait for the solstice to say that Summer has arrived, and that's hardly surprising considering the temperature is forecast to reach 31 degrees today. We are still having cool nights and mornings though, and during the last ten days we had rain, wind and a dust storm. The weather gods threw just about everything at us, except extreme heat, which is no doubt, ahead of us. On a couple of days, it was back to winter clothes! The garden really appreciated the 28 mm of rain we received, and I'm quite glad we avoided the 100 mm+ that some parts of Sydney received in just a few hours, causing tremendous havoc on the roads, flooding in houses and downed trees. There were even viral images of a waterfall overflowing off Sydney Harbour Bridge, but of course that was fake news. I'm joining in with the Six on Saturday crowd again after an absence of a week. You can discover what other SoS participants are doing in their gardens here. One: This is Salvia "Celestial Blue'. A native of California, it is a hybrid of S. clevelandii and S. pachyphylla. Its whorls of flowers remind me of the InSight lander that alighted on Mars last week and I almost expect little probes to appear to steady it in the breeze. I have seen 'Celestial Blue' Salvias online that are much more intense than this one, so perhaps my information on its parentage is not quite correct. I'm sure there will be a Sixer who can enlighten me. Two: Another Allium. This one has a jaunty pixie cap which is almost ready to fall and expose the misty mauve flowers. I’m charmed by the way the sun is highlighting the folds in its cap. 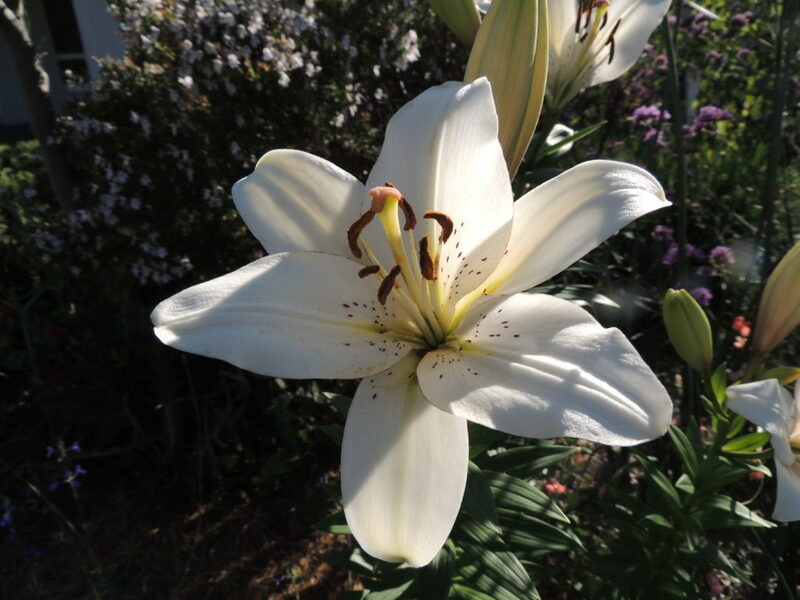 Three: Planted last Autumn, this early Lilium 'Eyeliner' is luminous in the early morning sun. A scattering of freckles dances across the pearly petals: it looks such a fragile flower, but it didn't miss a beat in last week's rough weather. I'm looking forward to this bulb establishing itself in the garden. 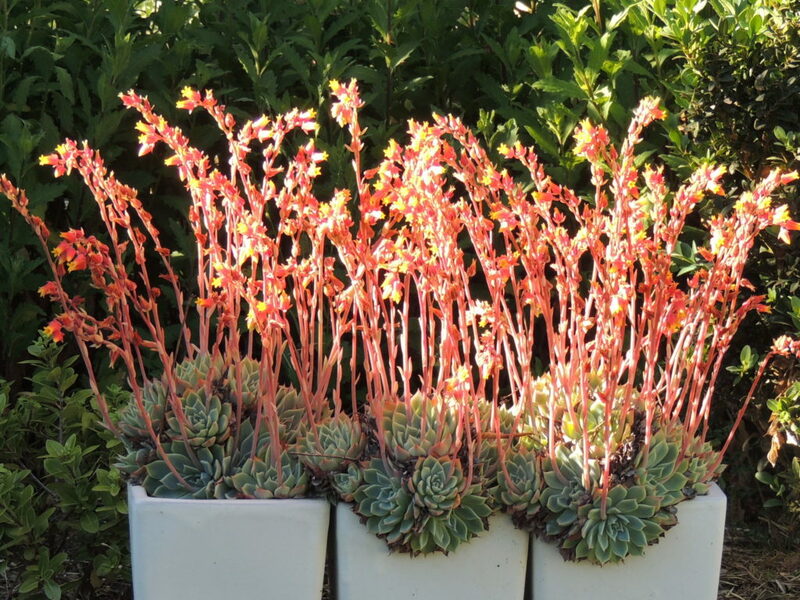 Four: A trio of Echeveria plants catches the sun. Five: During the winter Mr MG and I released our two bay trees from the pots they had inhabited for about six years, and against the advice of a couple of sixers, planted them in the garden. One is doing very well, pushing out new growth and behaving impeccably. 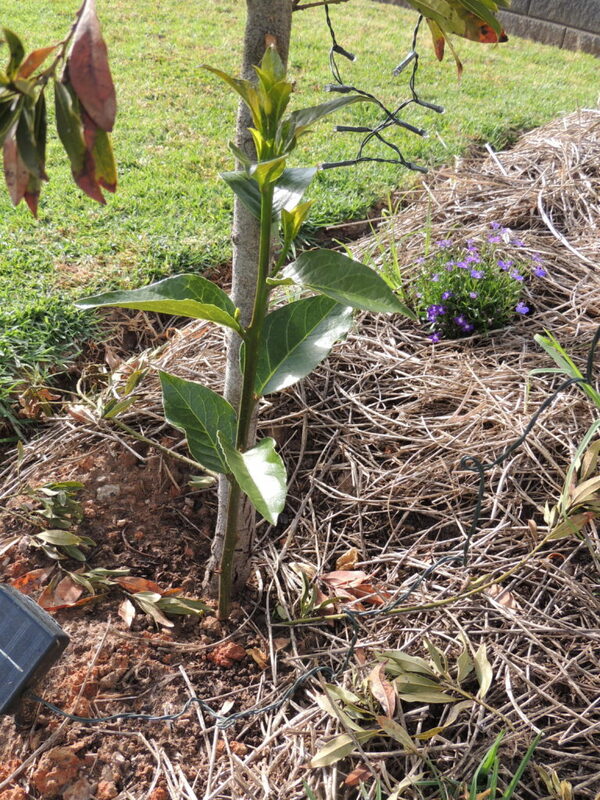 The other, this one you see in the photo, is about as miserable as a plant can be and hasn't grown a single new leaf. Those that it has are brownish, dull and unhealthy. It has, however, developed one perfectly placed sucker which is growing straight and true, albeit with leaves that are at least twice the size of normal bay leaves. The question now is whether to amputate the parent tree and let the sucker grow. I am open to suggestion! 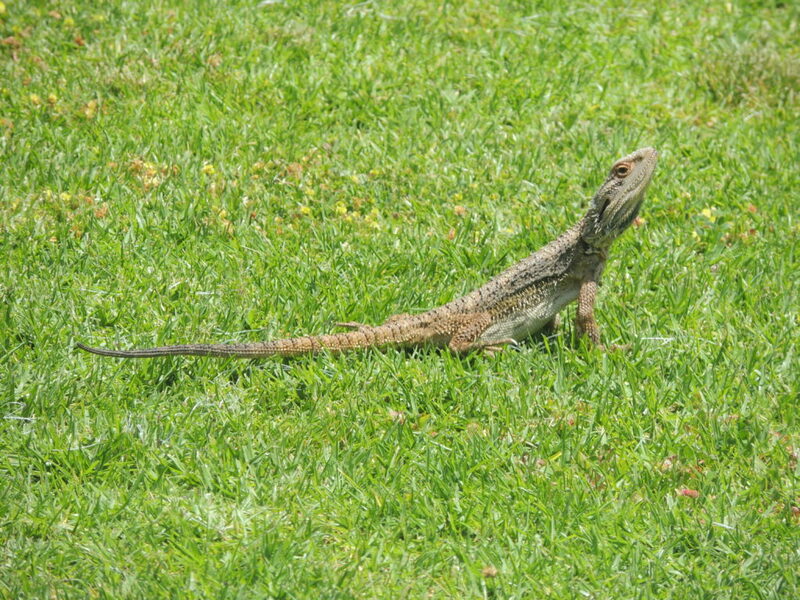 Six: Another presence in the garden is this Bearded Dragon (Pogona species). In fact, I think he (or she) lives in the garden, because I've had quite a few sightings. This lizard is about 50-60 cm long from nose to tip of tail, so is not small. That's my six for this week. Weather today: sunny, 9-30 degrees; we didn't quite make the forecast top of 31. Previous Post A Single Man? The flowers are all beautiful, but I LOVE the Bearded Dragon! He’s a beauty and such a welcome visitor to the garden. The base of the main stem of your bay looks to be splitting and if the visible leaves are representative I’d say the main plant is all but dead and the decision well on the way to being made for you. Is that bark peeling away? Yes, Jim, the bark is splitting. We think this is the result of the heavy frost we had last winter. It’s very strange that the bark of the other tree has even more splits in it and yet it is doing so well. Amazing display of Echeveria in flower. Stunning. I also think that old dead, dying or diseased wood needs to give way to young vigorous healthy wood as a general principle. The Echeveria thrives on absolute neglect and is very cramped in those little pots, but it doesn’t seem to mind! Wonderful photos, Jane. It looks like a garden full of aliens! I must admit that those echeveria made my heart skip a beat. Just glorious. Love your resident dragon too. Thanks Tracy. A garden full of aliens- you might be right! I love the echeveria!!! What a stunner in those pots. It’s hard to imagine summer when everything is dead here. Thank you for sharing your lovely plants with us. They are most cheerful. The Echeveria seems to have stolen the show, Cindy! It a very obliging plant that needs no attention. Occasionally I divide it and restart it in the pots when its cramped situation gets beyond ridiculous. Great photos of Echeveria and I also liked the cap of allium … It’s a pleasure to see some sunny and flowery photos because we have only days of rain this week … enjoy ! We have a long, long period of sun ahead of us, Fred, and wish we could have more rain! Lovely six. I really like that lily. The lizard looks huge! Those Echiveria are lovely. Not much sun here to shine through plants! Enjoy your summer – we have another 6 months to go to ours! Thanks Granny! We’ll have sunny weather now until well into April, but as long as we get some rain, I’ll be happy. I always enjoy your SoS posts. 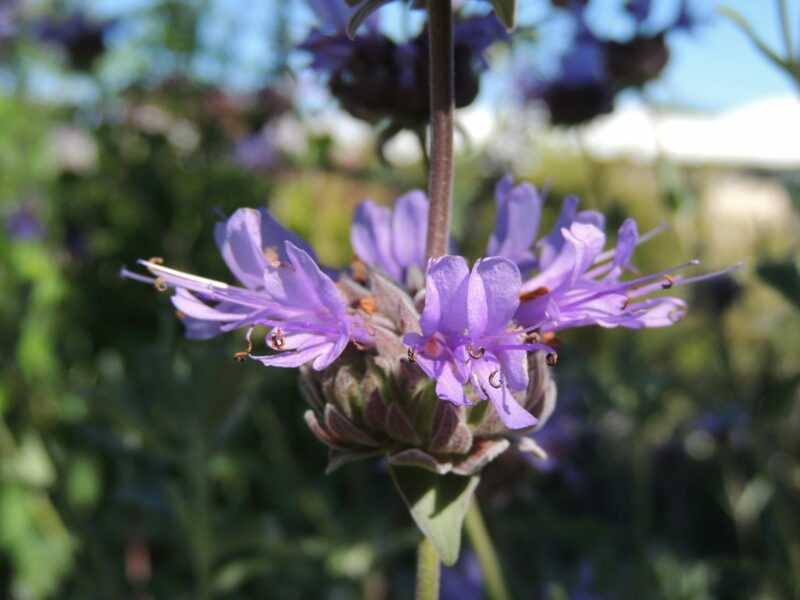 I was pleased to see a native California shrub blooming in your garden, especially as I’ve used so many Australian plants in my California garden – it seems only right that there be an exchange of sorts! I planted ‘Celestial Blue’ here years ago, only to have it languish and die; however, I think I just chose the wrong spot. I have 2 other Salvia clevelandii and another hybrid of that species, all of which are doing fine. I can’t advise you on the bay tree, even though I have a whole hedge of the stuff. I do my best to remove the suckers when they appear but still feel the hedge is mounting a massive invasion from the very bottom of our back slope. Have a great weekend, Jane! Thank you, Kris. ‘Celestial Blue’ is giving me so much pleasure as it’s quite different from my other salvias. I’m very surprised yours didn’t survive as it would have been in its own home, as it were. I will cut the bay tree as I’m sure the new sucker is going to do just fine. I think the problem was caused by frost damage, so I’ll have to take measures to protect it next winter. You have a lovely weekend too, and perhaps some rain??? I asked Nigel what he’d do.. he said he’d cut the old bay off a couple of inches above the ground (with a 45degree cut so any water runs off) and he wouldn’t paint the cut with anything. Cheers Jane! Thank you, Liz, that’s exactly what I’m going to do. Love your lizard! And isn’t it nice that summer is here? It certainly is. I love Summer most of all, even though it can be very hot and dry here. It has been much admired, and yet I only included it at the last to make up the numbers! Such an easy care plant. I researched what a bearded dragon eats, and it appears they are omnivores but mostly eat plant matter, although ‘small insects and sometimes other lizards’ were included. I suppose that could mean snails and slugs, but judging by the number of snails in in my garden, I’d say our resident has not been terribly interested in them. We always look forward to the salvia. We had four different ones last year. I was surprised to read some are prohibited and in the US they are banned in many states. Apparently you can dry and smoke it which some people apparently do. We don’t get lizards. Our Jack Russell is to blame for that. Today 26C and finally we can stop heating. It has been a cold spring. I might give smoking my salvia leaves a miss, Gerard. I look forward to mine as well as they are truly summer plants. It has been quite a cool spring, but horribly windy here today, drying out any benefit of the recent rain. That Lilium is certainly a beauty. I don’t know enough about gardening to advise you on the Bay tree that’s poorly. But don’t forget Bay trees grow to enormous heights, so not sure that you’ll end up having to continually prune to keep your, newly planted in-ground ones, at a small size. Great to hear you have a lizard in your garden. The more wee critters the better I always think. It’s a sign of a healthy ecosystem when you get plants, insects and wee critters in a residential garden. Our plan is to keep the bay trees to a reasonable size and clip them into round balls eventually, Vicki, and hopefully they’ll not be too much work. Hopefully they should block the view of the horrible metal fence and the neighbour’s roof. You’re right about having creatures in the garden and our lizard has been here a while, so he must be happy. I love salvias and have several varieties. They are so hardy and just continue flowering all year round. Your garden is looking beautiful! Thank you! After today’s gale and hot temps, it’s a wonder anything is still standing, and of course it’s as though we never had rain a few days ago. Even some of the salvias drooped. Hello there! I just came across your blog, and I am happy to find that we seem to have the same climate. I will be exploring your posts for inspiration and plant ideas. Greetings to you too, Karen, how lovely to hear from you. I’ll pop over to your blog and check it out too. I’m enjoying the Salvia so much as apart from its shape it’s a different blue from any others I have. Thanks for your summer greetings, Gill. I’m enjoying these early days: soon it will be too hot to do much gardening! 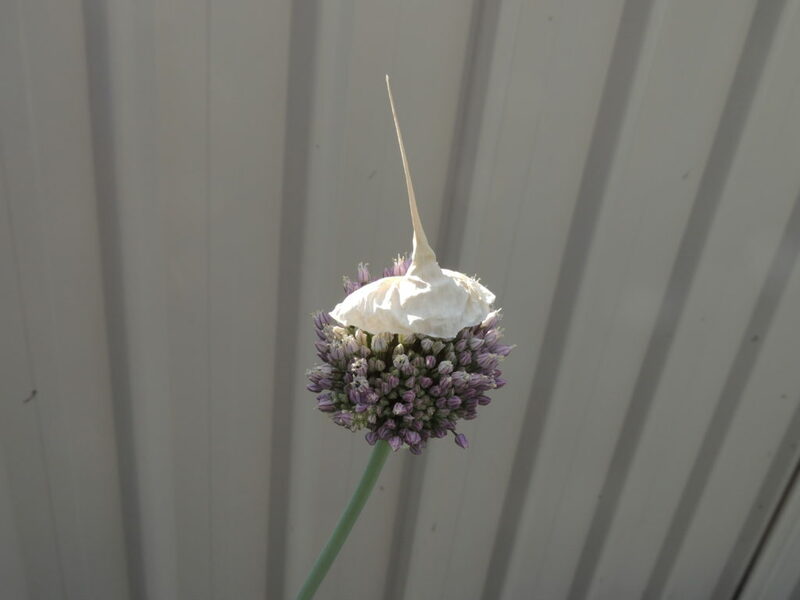 I love your photo of the Allium, Jane – I don’t think I’ve ever seen it captured with quite that jaunty look! 😉 and I’m sighing over your lily; I was never able to carry any through summer here – at least not in a healthy state fit to bloom the next year. And of course I adore your dragon as I love lizards in gardens, though it’s been a bit of a struggle as BettyTheDog most definitely does not think they should be there… Love the way he is keeping an eye on you and the camera! Happy summer – hope it’s not too vicious this time around! Thank you Amy. It’s been surprising how that particular Allium (whose name I don’t know)keeps its hat for quite some time. I wonder if you grow those where you are? I’m sure you could. The reaction to the dragon has been quite surprising as they’re very common here. He certainly was keeping an eye on me, and I was hoping I could get a shot of him with his beard puffed out and looking dangerous, but he remained calm. Hello Jane. I love those echi doodahs. Very colourful in the sunshine. You can lop off the dead bay stem, no bother. Lovely to see your summery six. The pixie cap on the allium is adorable. That’s a gorgeous salvia, new to me. And to have lilies in bloom seems a far off dream. Love your pet lizard. Those particular Alliums, which I’ve not been able to identify, keep their caps on for a surprisingly long time, Chloris. They’re very cute. Summer is certainly upon us in full force here- lots of hot weather to come! I hope you post photos of your Alliums Lis. I’m slowly building them up, and I’m longing to see a group of them making a real impact – getting there with the drumstick Alliums. I love summer, despite the heat, just wish it would rain more often! The hats on the tops of allium plants were always a treasure to my daughter. But she’d have run from the lizard. It is so good to see them in gardens. I have to admit that I often get a shock when I catch a glimpse of the lizard as I’m a bit paranoid about snakes, and we have had them here – in our compost! Thank you, Makiko. The dragon has been very popular! Happy Summer to you, Jane! Although I sympathize with your dread about the oncoming hot temperatures. I love the little Allium pixie cap – so cute! The Echeverias are gorgeous, too. And, I would happily trade your Bearded Dragon for the two bunnies I saw in my garden the other day. Yikes! Thank you, Anna. Mostly I only worry about the heat from the garden perspective and *if* we get enough rain, it’s all ok. We have a very dry heat here…much more bearable than humidity. The dragon has been much admired, and best of all, he doesn’t cause any damage in the garden!